My good friend Gudrun Erla of GE Designs is celebrating 10 years of designing quilts, fabric & more! She is having 10 days of giveaways to celebrate this great accomplishment. One of my favorite books by Gudrun is Big Blocks, Big Style. Gudrun is also a fan of 60° Triangles like I am. You could use the Hex N More or the Sidekick to make some of the quilts in her book. For projects that require a larger 60° Triangle I suggest the Creative Grids 12" Finished 60° Triangle Ruler. Here are a few quilts from Big Blocks, Big Style. This first quilt is Easy Hex. Gudrun taught this as a class when we in Portland together back in March. Some of her students had been in my Hex N More class the day before & figured out a way to use the Hex N More for this quilt! Another great hexagon project is Easy Hex Split. And of course I love Kite Runner since it features Prince Charming by Tula Pink! Gudrun's newest fabric line, Nordic Visions. 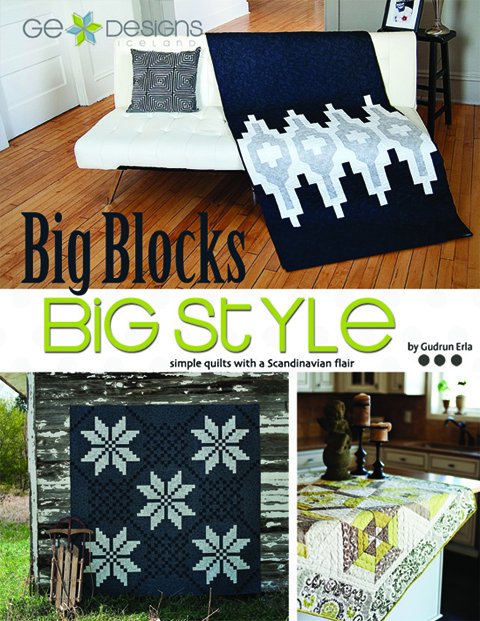 One lucky reader will win a copy of Big Blocks, Big Style and a Fat Quarter pack of Gudrun's newest fabric line, Nordic Visions. 2. In your comment tell us what you will make with the fabric if you win. I would use the Nordic Visions fabric to make Easy Hex from the book. You have till 9PM PST on Friday the 16th to enter. Great quilts and fabric! Terrific giveaway and oh dear, I think I'm the dreaded number 1. Another day on Gudrun's blog hop and finding a new blog to follow! This is getting to be fun! I do like these fabrics - not sure exactly what I might make but definitely something from her book. I would definitely use the Nordic Visions Fat Quarter pack to make the Easy Hex Split. I have seen this a couple of times on the other blogs and have taken a fancy to this one. 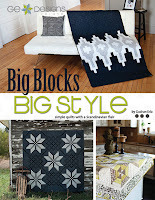 Thank you for the chance to win a copy of Big Blocks, Big Styles and of course, the fabric. I have enjoyed your blog and will be back again to visit you. I need a table top that is what I would make! I think the fabric would make fab napkins! I love the hexy table topper, but I think I would make the Kite Runner from the Nordic Visions, since I desperately need a holiday wall hanging for my living room. I think I could even get it done in time for Thanksgiving! I need a table runner and this fabric would be beautiful for it. Thanks for the giveaway. I really like her patterns and the new line of fabric! Thanks! I really like kite runner so likely that one the fabrics are nice I love red. I so would make the kite runner with the Nordic line. I am from Minnesota also and the Nordic vision is so much a part of my heritage. I love your rulers, well they are more thanrulers, they are new processes to create. thanks for the opportunity to win! I love the snowflake quilt on the cover of the book so I would make that quilt with the fabric if I won. That quilt reminds me of a knitted sweater--I love that look--very cozy and inviting. I would make a Ditto quilt. I wonder if you could make it from fat quarters? I would use the fabrics to make one of her fun quilt as you go tablerunners. I love the 60* ruler too! Would I love to win! I fancy making the Charm Shuffle from her book - busy, but fun. The Nordic Visions would be great for making some sewing room accessories - covers for my two sewing machines and pincushions. Great book. Love those big block quilts. Thank you for the chance to enter the giveaway. I do believe I would make a mat for my sewing machine and maybe a matching thread catcher. I would use the fabric to make an Easy Hex Split from the book. Love the Nordic Visions fabric and the scandinavian style! 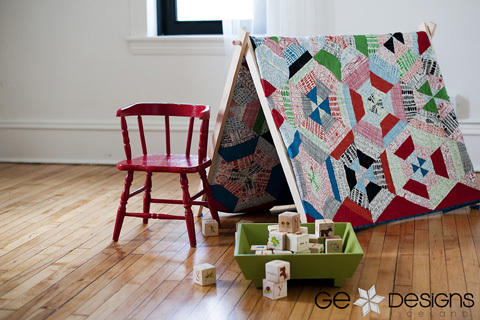 I'd use it to make a log cabin mini quilt, to use as a mat for my thrift-store-find Christmas candle pyramid. Beautiful fabrics! I would make pillows for my daughters new college apartment, the colors match her duvet cover perfectly! If I had enough fabric I would love to make Kite Runner! I would love to make either a easy hex or kite runner quilt out of the book! I love this fabric! I have so many ideas running through my head - hmmm, I have a few Jaybird Quilt patterns I could use with it! I love this fabric and book. I've been following the hop and am so inspired. I think I would make Kite Runner. Of course I'd have to buy some more fabric but it's a really good excuse to do so. I'd live to make the Easy Hex Split. It looks like fun! I am really wanting to make the giggles quilt with the new sidekick ruler and I think this line would be great for it. Happy anniversary to Gudrun. I love her patterns & fabrics. I'd make a table runner if I'm lucky enough to win. Thanks. I've never come across this designer before, but i love her stuff. I would make something with one of your fun new rulers! The possibilities are endless. I'd make the Kite Runner quilt from the book. Thanks for the giveaway. HI,I'd love to make a new table runner>this time for us! Thanks so for sharing! I would use Nordic visions to mke a kite runner quilt from the book. My daughter loved the book The Kite Runner nd I think the quilt would be a nice remembrance of it. Beautiful fabrics and great book. I would make a tablerunner or pillows. I like Easy Hex Split - the fabrics would make a fabulous fall runner. I would probably use the material to make a bag or sewing tote! Great fabric - I would make kite runner with it. Love this book. I would love to win it and the fabrics. I think Kite Runner would look wonderful in this fabric. I would make the easy hex split. Love the one the counter. Thanks for the chance. I would love to make the Easy Hex Split with these fabrics. Would have to had some more of her wonderful fabric to complete of course!! I'm making a bunch of lap quilts to give as Christmas gifts, and I would love to make one from those fabrics. Not sure what pattern I'd use -- I have to spend time with the fabrics before figuring out what would work well. Gudrun's patterns and fabrics are so beautiful, thanks for the chance to win! The easy hex quilt would be stunning in the Nordic fabric, but I would love to make any of Gudrun's patterns with her fabric. I Just want to be able to say that the quilt and fabric were designed by Gudrun. Thanks. I think I'd make something fun for me! Thanks for the chance! I'd make the Kite Runner pattern. It would look great with the Nordic Visions fabric. I will use the Nordic Visions fabric to make a quilt-as-you-go table runner from one of Gudrun's patterns. Thank you! I pictured a table runner right away with that fabric. I love the napkin idea, too! Thanks for a great giveaway. The book looks great and I think the fabric is perfect for kit runner. Thanks for the chance! I think something with hexies. I think I would buy more of the fabric and make Kite Runner...Love that quilt. I would make a small kite runner with the fabric to use as a table topper. Thanks for the chance to win. Oh yes, I would definitely make something out of the book. I love how the two darker quilts on the cover resemble knitting! I'm going to have to buy this book if I don't win it. I think the Nordic Vision FQ pack would be perfect for a Candy Dish pillow. I love Gudrun Erla. She was at our guilds Quilts and Coffee this past May. She put on a great trunk show. I think I would find a table topper to make with the fat quarters. Love the fabric and the book; it would be a lot of fun to win. Gudrun is a very talented designer. Love her patterns. I would love to make a tote bag with the pretty fabric. I love the 60 degree triangle too. It is so much fun to use! Those fabrics would work really well in a quilt I am planning for my mother. 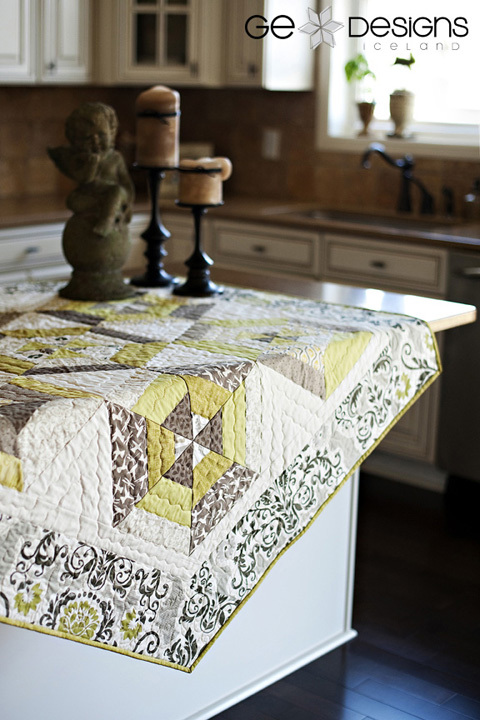 Such beautiful quilts and love Nordic Visions! What a gorgeous print with the big poinsettia, yummy! I'd love to make the Easy Hex Split with Gudrun's new line. Would look awesome on my table this holiday, hehe. Thank you and GE Designs for a super giveaway and a chance to win. I've been a fan of Gudruns for a few years now, she has some lovely fabric and I really enjoy a lot of her patterns. Hmmm, I think those fabrics would look really good on my wall :) So if I won I would design a wall hanging with them. Thanks for a great giveaway. Oh, I love the star quilt in the bottom left corner. I'd make that one! I would use Nordic Visions to make the Sea Side quilt! Great fabrics! Would use the red and white for my Dear Jane and use the rest to a autumn table runner. Thanks for the chance to win. I would definitely use this fabric to make one of the lovely quilts featured on the cover of this book! I think those fabrics would look great in a kiterunner quilt. They are so wonderfully colorful. I'd make a quilt for sure...maybe a quilt to take in the camper for chilly nights :) Something with stars on it. This book looks wonderful! I'd love to use Nordic Visions to make the quilt that is on the white couch. It would look so beautiful made with her fabric! Thank you for a great giveaway! ruler, and this would be perfect!! I love the first pictured quilt and now want to make it. Some new fabric would makethe decision of what color scheme that much easier. thanks for the giveaway. I would use the Nordic Visions fabric to make Kite Runner.... oh what fun that would be!!! I don't know wist I would make! I have to think about that! But I do love the fabric line and LOVE the anniversary hop! Thanks for the giveaway! I would make some sort of quilted item, I am sure. Great giveaway - thanks for the chance. I love the Kite Runner quilt so I would add some yellow and grey to the Nordic Visions bundle and make one for my friend who is refurbishing her room. Since I have your Hex & More ruler, I would love to find a pattern in the book for the Nordic Vision bundle. Thanks for chance to win! Lovely fabric! I think I'd make something from the book, maybe downsize it so I could make something wintery for my table. Thank you for this giveaway and the gorgeous fabric. I think I would use it for an autumn table runner. I would make a table runner with the Nordic Vision fabric. Congratulations to Gudrun Erla I follow her blog. The book looks very interesting and with these lovely fabrics I would certainly make the Kite Runner and show it off at Christmas! Thank you for this info! I love this book - it looks great! I do think the fabrics would make wonderful, fun napkins. Love this fabric. Would use it to make something from Fast and Furious Christmas. I love my hex and more ruler. I haven't tried stripy hexes yet, and these fabrics would be just the inspiration. The first thing I would try would be that easy split hex table topper! I'd love to make a picnic quilt! A hex fall table runner. Love your hex and more ruler. Great give-away! Thanks for sharing Gudrun Erla with us! I have a background in weaving and knitting and can appreciate her inspirations for her quilt patterns. I went to http://www.gequiltdesigns.com/ to see more designs. I love the Carnival pattern found in her new book. The fat quarters would make up very nicely in this pattern. I'm in love with that fabric, I want to make my sister some pillows! Thanks for the giveaway. I would make a lovely winter themed table topper. Love the patterns in the book and the fabric line. Well...I would NEED to find a block that would frame that gorgeous (swoon,) floral on the top...maybe a tree skirt would be in order...or a table runner...the book looks FAB! Thanks for the giveaway! I think the Nordic Vision fabric would look great in the Kit Runner quilt, but the quilt at the top of the cover looks fabulous, and that's the one I'd make first. Thanks for the chance to win the book and fabric. I think I would love to make a table runner with those fabrics. I plan to use the Nordic Vision fabric in one of Gudrun's designs. This way I'm combining her fabric with her pattern. I would love to play with this book and my hex n more ruler! I would use the Nordic Visions fabric to make the gray star quilt from the lower left corner of the book. Thanks for the chance to win! I'd make the Easy Hex quilt. I loved it at first sight! And I have the Hex N More ruler so all I need is the book and the fabric. I love this fabric and would make a bed runner! The book looks amazing, so many gorgeous projects !! Thanks for sharing in the hop, it has been inspiring! Not sure what I'd use the fabric for but I know it would make a great addition to my stash!! Thanks for the great giveaway. I would use the Nordic Visions Fabric to make the Kite runner quilt. I just ordered the Big Blocks, Big Style book the other day. Can't wait to get it. Have a great day! The quilts look fun and that big floral is awesome! I'm currently scouting out darker fabrics for a quilt my mother is making for me...lucky me!...which I think is a take on wagon wheels. I love the easy hex split pattern and would definitely be making it using my winnings! Thanks for the opportunity to win these wonderful prizes. I would make the star quilt it immediately caught my eye. Thanks also for the tip re 60 degree triangles. Will have to give this a go with my hex n more ruler. Thanks for the opportunity to win this wonderful prize. My eye was immediately drawn to the star/checkerboard quilt. It looks amazing. Thanks again! Easy hex split with Nordic visions looks like a dream project. Thanks for the opportunity. I would make an Easy Hex split as a wall hanging for my quilting space...love the colors of the fabric! awesome quilts and fabric, thanks for the giveaway. I love the kite runner quilt. I would use the fabric to make that pattern from the book. Thanks for the giveaway! OOH, I've had this book on my wish list for a while! I think I'd make a table runner with the fabric. Wow these quilts look amazing. If I won I'd probably use the Nordic Visions to make a version of that beautiful Kit Runner quilt. It would be a challenge for me but oh so rewarding and also an excuse to buy extra fabric to go with the winning Nordic Visions. Love the fabrics! I would make a bed runner. I like the kite runner quilt and the Nordic fabrics would look fabulous in it. Thanks for being in this fun blog hop. I would love to own that book. I would make the snowflake quilt using fabric I have on hand that I think would be perfect, and then I would use the GE fabric bundle to make "Chopsticks". 2 projects from one giveaway! Thanks for the opportunity to win. Lovely fabric! I would use the fabric to make one of the quilts from her lovely book! I really like kite runner pattern and would use the fabric for that pattern. Thank you for a chance to win , nice giveaway. I would love to try a hexagon quilt. I love the Easy Hex split and would use the Nordic Vision for that. What a wonderful opportunity. Thank you. Happy Sewing. Beautiful fabric. Love the colours. I think it is saying " throw pillow" to me. Thanks Julie! I love your ideas. If I win I want to make a table runner or table topper. I would make a love quilt for donation. Great giveaway! I'd use the fabric for a table topper or placemats. Thanks. I love Gudrun's book and Nordic fabrics. They would look beautiful in any quilt. Thanks for the chance to win. Enjoyed your Blog. I think the fabric would look great in Easy Hex Split. Thanks for the opportunity to win. Gorgeous, Christmas present for mom, easy hex split for sure! I think I would try to make a hexagonal tree skirt (with multiple hexagons, of course) with the fabric. Thanks for a chance to see more of Gudrun's work and to win some goodies! I would use the Nordic Visions Fabric to make the very first quilt on this post..the one it looks like a black border with whit and gray blocks and white cross in the center.....beautiful quilt. I like the Easy Hex Split table topper in the Nordic Visions, also. What a great celebration this has been. I could see using the Nordic Visions fabric for a quilted purse and matching wallet. From the book I would love to make that bottom left quilt that appears on the cover. Thanks for the chance to win. Congrats to Gudrun! I adore the Scandivanian designs and I would use the fabric to make a quilt for my father who is Finnish. thank you! I am new to using hexies but I would love to try something with the Nordic Visions. I have a new table (well, we bought it used, but it's new to us) and it is begging for a long table runner. These fabrics would be perfect for the room! Thanks, and congrats to Gudrun again!!! I LOVE Gudrun's book Big Blocks Big Style...but if I won the Nordic Visions fabric I'd use it to make Jaybird Quilts "Three in a Box!" It is at the top of my To-Do list. SEW Fabulous. Would love to win!!! Thanks for all the chances to win!!! The Nordic fabric is so beautiful. I would use it in a simple design like Kite Runner to show off the beautiful prints. Oh, definitely something from Fast & Furious. Thanks! Thanks for the opportunity to win. I have just started doing Big Block quilts. Love the nordic prints and would likely use them to make kite runner. I wouldn't mind trying the Hexie Split! The fat quarters would be a perfect fit! I would make a tote bag for my mom for Christmas! It looks fabulous! Thank you Julie and GE Designs for the chance to win. I would use the Nordic Visions fabric to make the Easy Hex Split. It would look great on my kitchen table. Love Gudrun's designs! I would like to do a modern quilt with the Nordic fabrics. I would looove to have the book. Julie- if the random number generator picks me, I'll make a Rock Candy table topper! Thanks for the giveaway! I think Easy Hex Split would look great in the new Nordic Visions fabric! Love so many designs in the book! Such beautiful fabrics! I think I would make a lap quilt for my family room. The colors would brighten up the room! Hi, I have just completed a baby quilt using your hexi ruler. I made your science fair quilt.It was great. Now if I win some of Gudrun's fabric I would love to use it in a Christmas quilt probably for my son's new house. I think he would really like it as it is him. So I will keep my fingers crossed and hope for the best. Congratulations and may the creative juices continue to flow for many years to come. I can see a table runner or a tote bag with these fabrics. They are beautiful and cull of color. I love the flowers. I'd love to use the fabric to make the Kite Runner quilt pattern. I think they would look great together. I think I would like to try the Easy Hex Split! Thanks for the giveaway! I love Kite Runner! Think I would make the Easy split Hex table runner. Love that fabric ... I would love to make Carnival from their big blocks book ... Love their style !! Thanks for the giveaway. Hi: I would make a table runner for my daughter. We are of Scandinavian descent and this would fit right in with her decor. Great looking designs-both quilts and fabric. I would make the easy split hex table runner. I'd use the Kite Runner quilt. Congratulations on 10 years Gudrun. Our new fabric would be lovely as an autumn Easy Hex Split runner. So lovely! 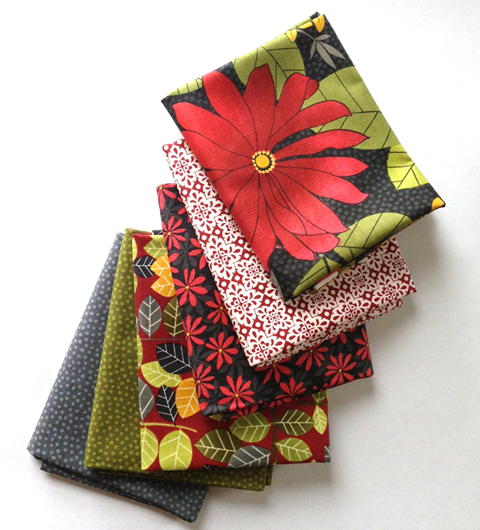 I love the Nordic Visions fabric especially the big red flower--poinsettia, my favorite winter flower. I would make a table topper for cabin table. Happy Anniversary Gudrun! The fabric is beautiful! I would made a tablerunner! I'd use the Nordic Visions fabric to make the Kite Runner quilt. It's so fab! I think maybe something with a zigzag would look good with these really fun fabrics! I'd make a table runner, probably for a gift for a friend. I'm not sure of the pattern, but maybe something that strikes me is in her book! I have wanted to make a 60 degree triangle quilt and these look like good christmas fabrics, I'd add some more and make a couch quilt for Christmas. I would use the fabric for my scrappy tumbler quilt. If I win the drawing, I would make the Kite Runner pattern. I love the idea of quilt as you go patterns. Hope I win! Love the fabrics & the book definitely looks like something I'd enjoy using. 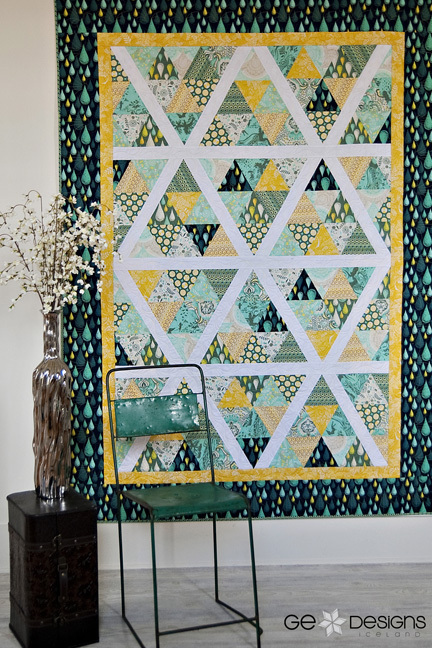 The Kite Runner pattern looks like something I'd enjoy working on with those lovely fabrics! I would use the gorgeous fabric to make an Easy Hex Split for my Christmas table. I would love to use the Nordic Visions fabric to make the Kite runner pattern. The book look terrific! I'd use them with my stash to make the boys a placemat each next holidays.